Did the cold climes cost Aruna a place in the final? 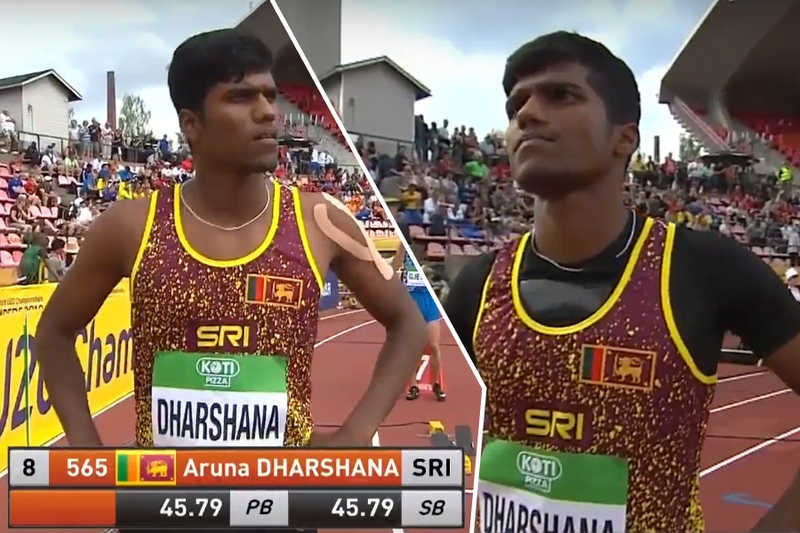 Home Athletics Did the cold climes cost Aruna a place in the final? 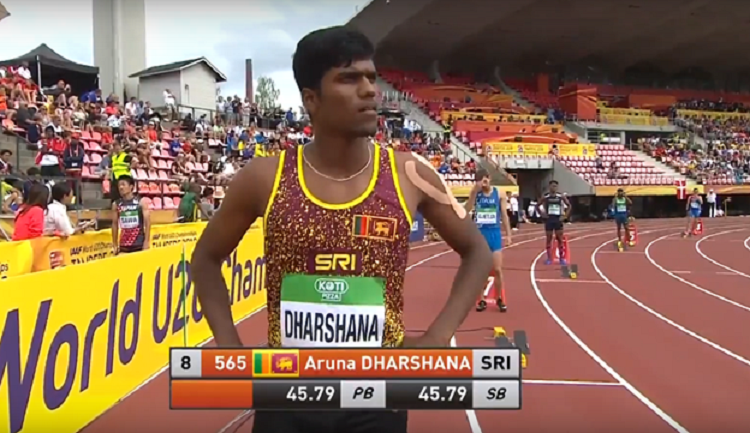 Sri Lanka’s prime medal hope at the IAAF World U20 Championship 2018, Aruna Darshana crashed out of the Men’s 400m Semi-Finals finishing the race 5th clocking 46.75secs. Competing in the 03rd semifinal heat, alongside the young Jamaican prodigy Christopher Taylor billed as the next ‘Bolt’ from the Caribbean nation, Aruna had a good opening 300m but could not find his usual stride on the home straight which costed him a place in the final with only the first 02 alongside the 02 fastest losers of the 03 heats making the cut. 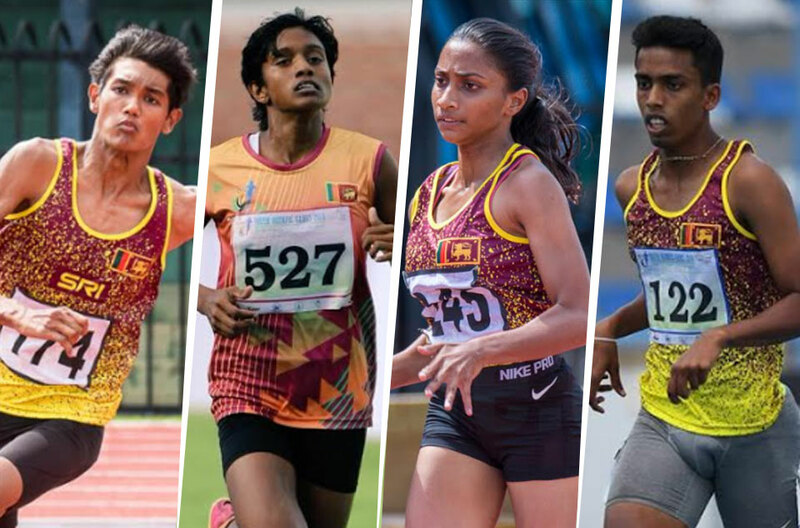 Quarter-miler, Aruna who has become the darling of the track and field community of the country, carried the nations hopes for its first World Junior medal ever at this year’s competition. With some incredible performances in the run up to the IAAF World Youth, Aruna was in top form in the run up. 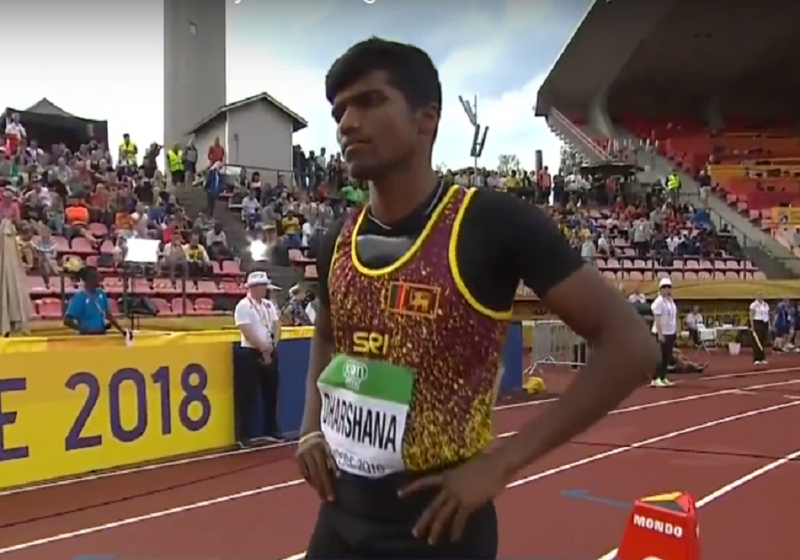 He ran an astonishing personal best of 45.79secs at the Asian Junior Championship, held in Japan, last month, becoming the Junior Asian Champion in the 400m. This was the 4th best time ever recorded in Sri Lanka and the first sub 46sec performance by a Sri Lankan since 2006. Aruna had no contest in Japan and looked to be jogging in the final few meters despite clocking the impressive time. This timing placed him 7th best U20 quarter-miler in the world in 2018. In the first-round heat youngster cruised to the semis with a comfortable run of 46.81secs winning the race. Aruna’s PB would have secured him a place in the final and would have guaranteed a place in the final with the fastest qualifier in the semifinal only clocking 45.72sec. 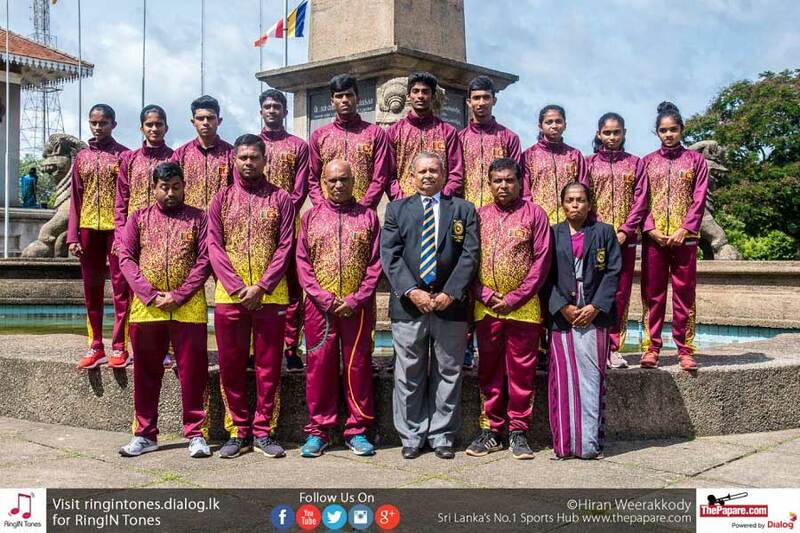 The five-day championship held in Tampere, Finland had two sunny opening days but turned a corner today with the temperature dropping to 22 Celsius alongside rain which made conditions difficult for the Sri Lankan. To make matters worse, the second semi-final of the Men’s 400m was unsarcastically delayed. Aruna who competed in the third semi had to wait over 20mins in the cold before the race which could have hampered his performance. The Young athlete was seen sporting a thermal jacket under his running skinny which he did not wear yesterday during the first round. Jamaican Taylor who is the favorite to take gold having run a personal best of 44.88 at the Jamaican national’s, ran a controlled race, the slowest of the three semifinals, to take the victory clocking 46.18secs. 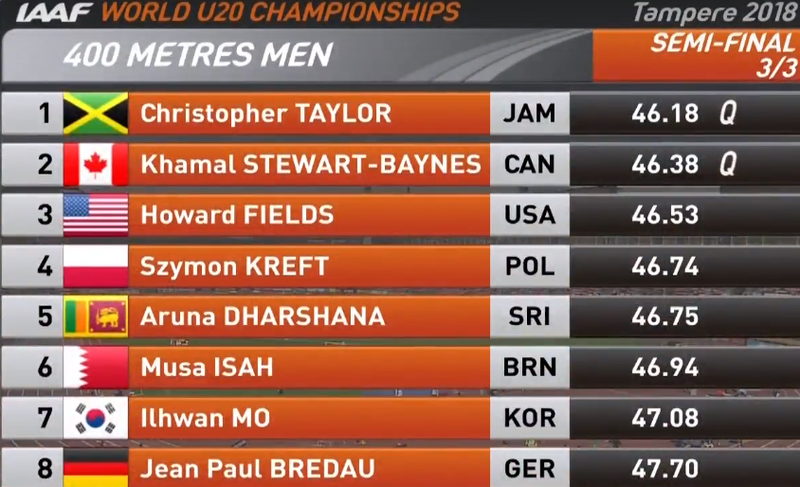 Canadian Khamal Stewart-Baynes was placed second completing the two automatic qualification spots while American Howard Fields qualified as one of the fastest losers. 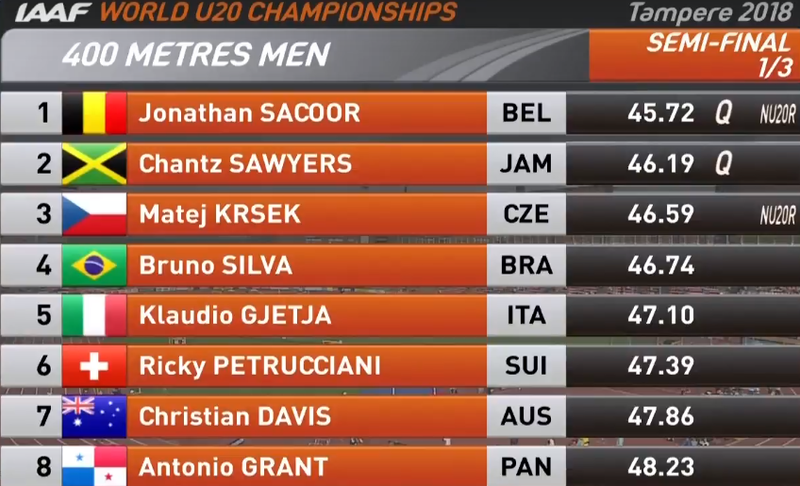 Earlier in the first semifinal Belgian Jonathan Sacoor ran a new junior national record time of 45.72 to take the win ahead of Jamaican Chantz Sawyers as the fastest qualifier. 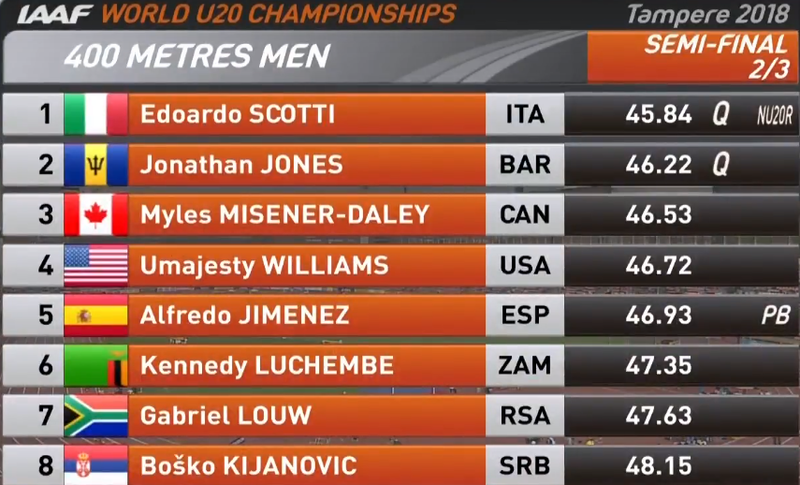 Italian Edoardo Scotti shocked with a massive last gasp to take the win in the second semi shocking Jonathan Jones and hard running Myles Misner Daley.